Thank you for the beautiful patterns that you make available to everyone. This outfit, 0053 Anders, was made as part of a Ravelry KAL. The doll is a Heidi Ott Faithful Friends Hannah. The experience gained making other of your patterns allowed me to modify the pieces to fit this particular doll. She will be styling on the ski trails or slopes. Meg, you did a wonderful job of knitting this great pattern AND making sure it fit your doll. Your comments on the Ravelry KALs are always helpful and I am so glad that they will be available when I get to making this design. What a beautiful job you have done with this outfit. The fit is perfect and she looks great in these colors. You are a fine knitter and it shows in your workmanship here. You inspire all of us at Ravelry to keep learning and keep knitting. This is very nice Meg! 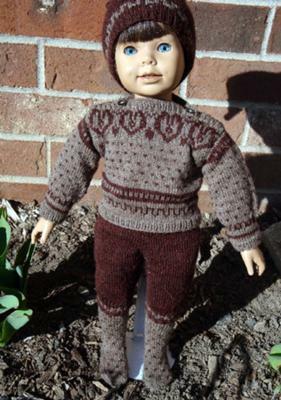 I am so glad you like my patterns and enjoy knitting them for your own dolls. Inspirates me to create new patterns!